Half drawing activity, half frantic game, Dot vs. 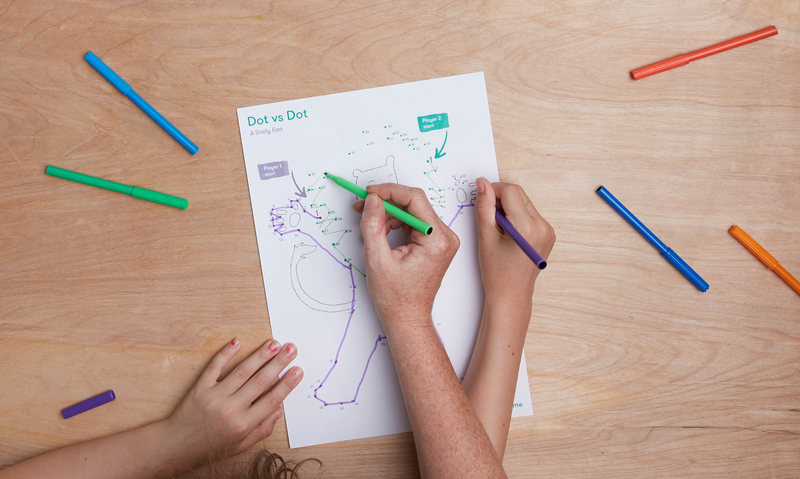 Dot is a fun and sometimes hilarious way for grownups and kids to draw together. Each player has a part of the drawing they need to complete. The twist? You need to do it at the same time. Make it entirely collaborative for some relaxed drawing time. Or, for a little craziness, compete against another team or just the clock. (Avoid squabbles by emphasising you’re finishing the drawing together – teamwork!) You’ll find instructions and a scoresheet in the download sheet below. The characters in this activity, Lion, Snail and Alligator, are from our personalised book based on your child’s name. If you enjoy this idea, let us know on Facebook and maybe we’ll add some new Dot vs Dot character sheets.